Letchworth pod is conveniently located at Sainsbury’s car park in the heart of this well-known ‘Garden City’. Being located at Sainsbury’s car park gives customers an ideal setting to pop by and receive a quote. The convenience of this WeWantAnyCar.com’s pod makes it easy for customers to sell their car quickly. So if you’ve been thinking of selling your car in Letchworth our friendly staff can offer guidance and advice on the best options for you. 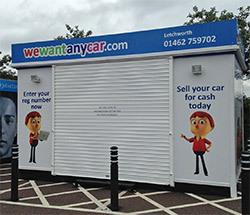 It is really quick and easy to sell your car in Letchworth with WeWantAnyCar.com. All it takes is a click of a button to get the ball rolling. Simply enter your registration number and receive a FREE valuation on your vehicle. Just like that you’ve started the process of selling your car to WeWantAnyCar.com. Once we offer you a car valuation, you can then arrange an appointment at our Letchworth branch. In fact, the process of selling your car, is so simple with us, we can often arrange to do it on the very same day. It really is that simple to sell your vehicle with us, and best of all you’ll receive the cash payment into your bank in as little as four working days. So, instead of thinking, "Where can I sell my car in Letchworth? ", pick up the phone and call WeWantAnyCar.com today. Nice and simple, my car did have a few bumps and scrapes on it. i had been trying to sell privately but the marks, although only cosmetic, had put people off. Went onto the website and filled in the condition of the car, quote from we want any car was about £500 higher than any other similar site so i booked an appointment. I was apprehensive as i have heard all the stories that they will never pay the quoted price and will find some reason to mark down the value. Had appointment with Gerard, firstly he had a look at the service history and sorted through my 7 years of receipts bonus he found a service which had not been stamped in the book my incomplete service history was a little better than it first appeared. Then he had a look at the car and picked up the damage that i was aware of he explained what he was doing and what he was looking for, after we went for a short drive to make sure there were no unusual noises - none found. Then was time for the verdict - exactly what i had been quoted online. Money was paid into my account exactly 4 working days later right on time. Just wish i had done this before paying to advertise my car for sale. I was offered a good deal on my Car, very pleased with the service they provided. Worked as you would expect. Quoted a price, money arrived promptly. Professional agent who knew what he was about. Quick and easy. Wins for convenience. Better than dealer trade-in offer. A straight forward, no complications transaction! A very friendly agent puts you at ease right away! Excellent experience! Would recommend to anyone looking to sell a car!